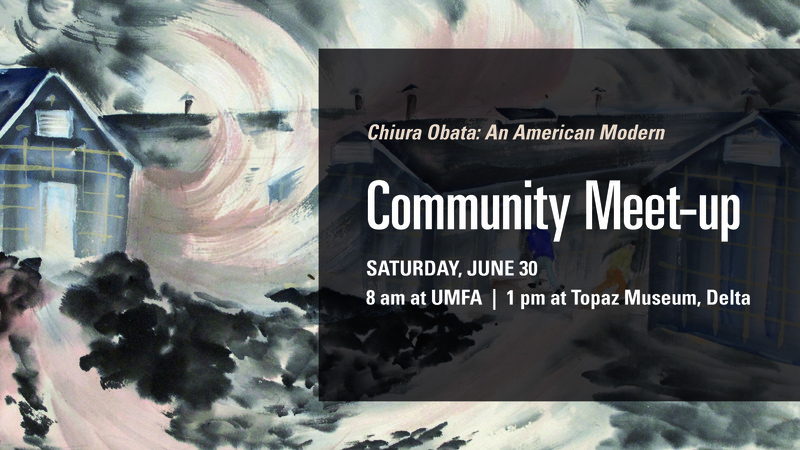 If you haven’t experienced Chiura Obata: An American Modern yet, come see it Saturday, June 30, during the UMFA-Topaz Museum Community Meet-up. Begin the day at the UMFA to see the exhibition free 8-10 am. Then make your own way to Delta and the Topaz Museum by 1 pm to see more of Obata’s work and take an organized trip to the site of the Topaz Relocation Center, where Obata was interned during World War II. 8–10 am | Free admission to Chiura Obata: An American Modern. Art-making activity in education classroom. Refreshments provided. 9–10:30 am | Curator ShiPu Wang leads informal gallery tours and signs exhibition catalogues (available in Museum Store). 1 pm sharp | Meet at Topaz Museum in Delta.